Click ADD PURCHASE button as shown below. SUPPLIERS: The system automatically stores the entry of each supplier. 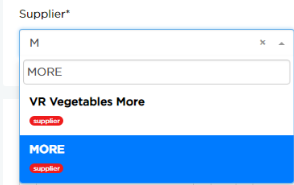 Since, "MORE" is a new supplier, it is highlighted as new. You can tag purchases based on applied categorisation. This helps in filtering and listing based on applied tags. As purchase is a critical part of COGS calculation, if you have more than one cost centers (food, liquor, beer, tobacco), classification and tagging is necessary. Classification and categorization are customizable, you can categorize purchases based on "Departments" or "Store" etc. In above example, we have used "Departments" and "Cost Center". Create cost center only for items that you sell.Things like housekeeping, papers, napkins etc, can be tagged under a department with separate tag. By this way, you can separately calculate the cost of items that are not sold. Post GST (in India), there is no input tax credit for restaurants. Total price of the SKU (including tax) is to be entered here, the average price of any SKU will be computed including applicable taxes. 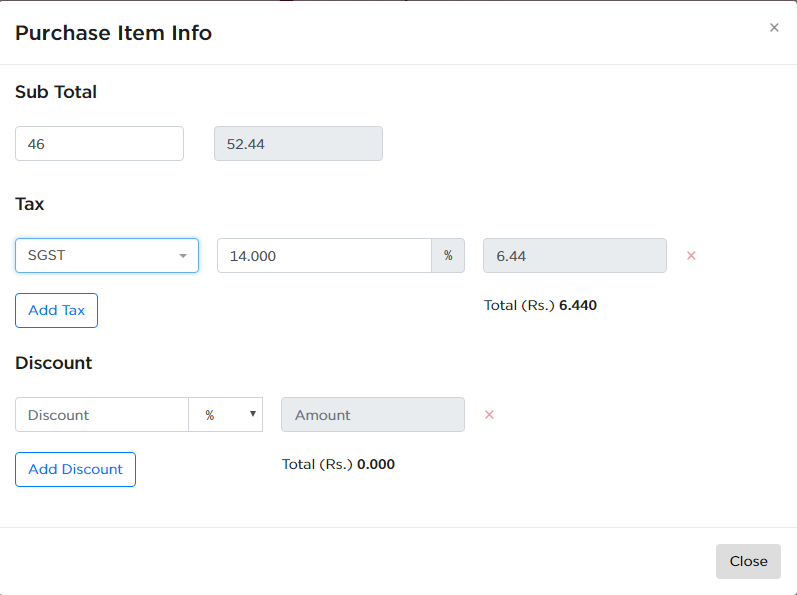 Items that are purchased before will automatically show the price and unit. First time entries will show up as &apos;new&apos; and gets added to SKU master automatically. 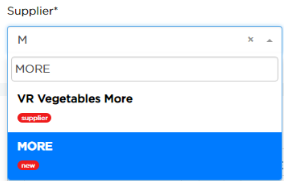 It is a good practice to categorise and tag the newly added SKU&apos;s.
Since these items are not sold, they need not be tagged under any cost centers. Remember to tag these SKU&apos;s under separate category. TAX Calculator: As shown below, you can effortlessly add the tax percentage to the price of the item. In the above example, 14% of tax is added and price is automatically calculated using tax calculator.Please select the the tax percentage applicable on the item and discount percentage if any. Most recent (last 3) purchase price for the SKU are also shown, helps track price changes and choose the appropriate suggestion if you are not on contract pricing.